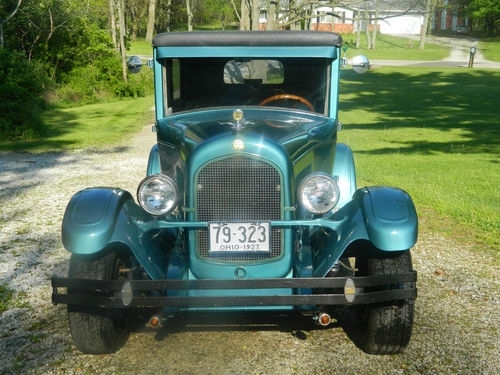 1927 Chrysler 2 Door Sedan, 318 V-8, Automatic transmission, Otherwise pretty much stock original. Runs and drives good, It was built about 15 years and stll looks good. It was not a high dollar professional restoration, but the car is quite presentable and unique, and 85 years old.........You could spend silly money on it modernizing it, or you could enjoy it just the way it is. It is a joy to drive and really needs nothing. You don’t see many of these early Chryslers on the road today. This is a fun car with enough room to haul the whole family. 1927 was only the 3rd year for Chrysler cars. This Old Girl will be 100 years old in another 15 years. I have updated the front brakes to disk brakes, installed a new master cylinder and a rebuilt carb so now it really runs good, and stops good as well. You can drive this car anywhere. Too Late, It is SOLD and off to East Texas with David. He knew a deal when he saw one. But if you really want a 27 Chrysler, I still have the Roadster, some assembly required.